There Was a Crooked Man… - Charley Brady - Opinons; My Own. This article appears in the August issue of Chicago’s ‘Irish American News’. Since writing it a couple of weeks ago nothing much has changed, although we have learned that Creepy Conman Kelly can’t even tell the truth about his own sister’s suicide. He is still swanning around with his dopey-looking Ned Flanders moustache and still wearing a smirk that says: ‘Go to jail? Me? But I’m a white-collar crook and this is Ireland’. He’s also looking for several thousands of ‘his’ money to be unfrozen so that he can pay the mortgage on his mansion – which I in my innocence had thought would belong to those he had swindled. Yeah. I keep forgetting. Ireland. White collar. And Big Angie Kerins is still putting away two lunches and three desserts before heading off to the High Court to see who she’s suing today. It’s a great little country to do criminal business in. The gorgeous Ashford Castle in County Mayo was singled out last month by ‘Travel + Leisure’ magazine as the best hotel in Ireland and the UK. And apart from the fact that it’s true I don’t think that even the most cantankerous individual would begrudge the success of an estate that employs 365 people, mainly locals. There are literally whole generations who work there and it’s nice to mention a genuine Irish success story. However, one of the jokes that accompanied the announcement is that you would have to be as wealthy as a charity Board member to stay there. And like most of the jokes that I find funny, it is one coloured with bitterness and anger. For the sad fact is that in the last month the charity sector has – once again – covered an already tarnished image in something less than glory. (I’d use another description but this is a family magazine.) And as usual, it’s all thanks to utter greed by those vain, posturing popinjays who pretend to be pillars of the community whilst in reality are nothing less than scum-sucking lowlifes with not an ounce of decency. As chance and miserable bad timing would have it, the children’s cancer charity that I do occasional volunteer work with — ‘Hand in Hand’ – had been about to release a tale of disappearing funds that I felt had the potential to be a huge story. And in this instance it was a case of a charity being sinned AGAINST. A sidebar first: I’ve mentioned before that I believe that once a CEO is earning more than a normal sum of money then they have NO DAMNED RIGHT to call themselves ‘charity’ workers. Especially when we’re looking at amounts that go beyond €100,000 or €200,000 or, God help us, €250,000 per year. If you want to say you’re a routine business or just part of corporate Ireland, that’s fine; but don’t pull the wool over people’s eyes by codding them into thinking that every cent they give goes to helping someone. You are being disingenuous at best and a scheming, lying, grasping toe-rag at worst. The reason I speak so much about ‘Hand in Hand’ is that there IS no CEO. There IS a Board of Directors, all of whom are voluntary and none of whom claim as much as a cent in expenses. There IS a team of two who earn BETWEEN them €55,000 a year. And that’s to organise help for families throughout the whole of Ireland. Nor is it one of those charities that simply duplicates or triplicates a service – another of my hang-ups – that others are doing. It is practical…and it is unique. It ALWAYS has its back to the wall in terms of cash — and because of arrogant, walking lumps of venality like Paul Kelly and THOSE WHO HAVE COVERED FOR HIM all decent charities have now been splattered with the same muck and filth that he turns out to have been caked in up to his fussy-looking little moustache. So yes, when I laughed at that joke it was tinged with more than a bit of bitterness and anger. Console has done fantastic work over the years and there are many out there who will testify to that. And those genuine people that volunteered and fundraised have been gutted; pure and simply gutted. I spoke to one young woman who had been doing work ‘on the ground’ and my heart went out to her. People like her gave their time and energy to raise money for what they believed was (and is!) a decent cause, only to find that much of it was being used to maintain the nauseatingly lavish lifestyle of a family of swindlers who make the Sawney Beane cannibal clan look like models of decorum. Trust me: if someone put a gun to your head and you found yourself in the unenviable position where you had to shake hands with Conman Kelly you would be checking both fingers and wristwatch afterwards. Trips to New Zealand; designer clothes; luxury cars; fine dining. Nothing was too good for a family who only seem to have been short of owning shares in the Bates Motel. I don’t often throw roses at RTE but they have done a tremendous service in bringing this to light. Yet incredibly, it was already well known that this chancer had in the past pretended to be a member of a religious order (the only member, as it turned out) and – wait for this – had impersonated a DOCTOR for three weeks in the 80s until he was caught. In fact, when asked this week if ex-Minister for Health James Reilly (sacked by the electorate; reinstated by Enda) had been told of this in 2011 he said that he might have ‘heard something about it in the canteen’. Did you ever hear the like? 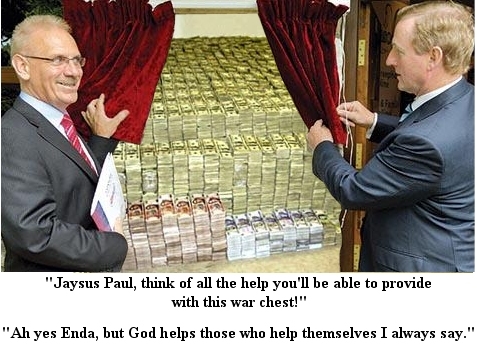 So the Health Service Executive (who I wouldn’t trust to tell me the time of day, never mind with a bag marked ‘swag’) merrily handed to him, with a whistle and a song, 12 million Euros over the 2006-2014 period – and I trust you’re sitting comfortably – despite being now convinced that he was as dodgy as Old Nick on Walpurgis Night. Still, what’s a bit of *wink wink* skullduggery between old pals? Don’t tell me the HSE didn’t know what was going on – they’re in this up to their oxters. So with all this suspicion on him, what happens but that OF COURSE he got the People of the Year Award for 2014. Yep. And that would be the same award that is run by the Rehab Group, of which the ghastly Angela Kerins was the former CEO — she of the egregious salary; who never saw a perk she could say no to; and who is currently in the High Court making out that she’s the victim of…something or other. Oh, yes; being bullied by the Public Accounts Committee. No kidding. She’s the victim. Someone whispered ‘First Amendment’ in her dainty shell-likes and she turned her fire on soft-touch-Ireland instead, where we tiptoe around, afraid to look crooked at people who are robbing us blind. Incidentally, Rehab wants Creepy Kelly to return his bookend ‘in order to protect the standing and integrity of the awards’. Integrity and standing, no kidding. At this point words fail me – and there’s something that my long-suffering friends don’t hear too often.